I just spent the past week in Port-au-Prince helping with the mobile clinics which OMS are running there and got back 'home' here on Friday. Im not really sure where to start. The situation in Port is really awful, this is 4 weeks after the earthquake, there are tents or makeshift tents out of sheets everywhere in the whole city, it seems even if people do still have their house some of them are still sleeping outside because of fear. There are alot of buildings which are completely ruined, its very strange actually you walk down the street and one building will be completely destroyed and the one next to it won't even have a crack in it. The thing which really struck me is that life is carrying on as normal, if you just look and didn't see the buildings ruined or the tents you would not know that anything had happened they are just continuing on as normal, there are people everywhere, people continuing to sell food/ clothes by the side of the road yet no-one has any money to buy anything. I got to speak to a lot of people and EVERYONE you speak to has lost a few people they know whether that is family, friends, a pastor, a teacher everyone knows someone who died in in the earthquake. Walking through one of the tented villages a wee girl came up beside me and I was talking to her, she is 12, lost her whole family her house basically everything in the earthquake now is living in a tent with friends. Yet she says it to me very plainly not showing any emotion at all, Im not sure if a 12 year old at home could cope with that, Im not sure if I could ever cope with that. Then she asked me if I could take her with me, she said 'I have nothing can I come with you'. Thats hard. I obviously cannot bring her with me but how do I tell her that. BUT everyone you talk to says I survived only by the grace of God, it was God who saved me. Or if their family is well then they say its only by God's grace. People are definately turning to God after such devastation. Here are some photos of downtown Port. 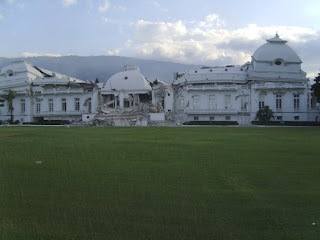 After a 10 hour journey in the back of a truck which is not enjoyable at all, we arrived at the OMS villa which was unharmed after the earthquake just a wee bit of damage to the ourside wall. We spent our time in port doing mobile medical clinics, the team who had been there before us were working in a place called Diquini which is right up ontop of a mountain, the view from the top in beautiful, you can see the whole city from the top. The way they work is people come in, see the doctor then get whatever medicine then go it to the last tent which has some of our seminary students in it. Each Patient gets to speak to a pastor, to get counselled, to get told the good news. The team before us had been there about 2 weeks and I think saw over 300 people come to know the Lord, which is amazing. So we had a team of people from kentucky who were continuing that clinic, then a new team arrived in on sunday and I went with them to a new site. We had between 200 and 250 patients each day, the medical bit wasn't like trauma medicine. Most people complaining that they can't sleep or can't eat since the earthquake. Or they have sore backs more than likely from sleeping outside. Lots of coughs and colds from the dust that is everywhere, the whole city is covered in like a smog of dust and dirt you see it as you drive into Port. I have lots of stories but I'll write more this week. At the new clinic site we saw 68 people come to know the Lord in just 4 days, the people are so hungry spiritually and in need of hope. Just pray for these new believers, to find a good church, for someone to help them with their discipleship and for them to grow in the Lord and to trust in him for the future. The situation in port is so awful, I can't really see how they will rebuild it, everyone is living in tents but they can't do that forever yet God is working mightly. Mardi gras (the voodoo festival) has been cancelled for this year. The Haitian governement announced 3 days of Fasting and praying from Friday to today. We drove past a lot of prayer meetings on our way home on Friday. And everynight we were at the villa we could hear singing in the streets and church services going on. The truck with our supplies in it, after that we put about 20 people in, it was a tight squeeze for the next 10 hours. I couldn't resist posting this, I mean Irish....really?? I have lots more stories and lots more photos, but I'll update during the week. please keep praying for Haiti, especially for those new believers. Im glad to be back 'home' and have heard of a few hospitals who are in need of physiotherapists right now so I will have to see how things work out over the next month or so.